"Best iOS Games of 2015 & Game of the Week Award" by Touch Arcade Editors. "Best iOS games of 2015 Award" by MacWorld, AppAdvice, FanSided and Apple 'N' Apps. "Metacritic score: 88 (#29 Best iOS Game of 2015)." "I feel like I could go on and on about Horizon Chase, it's really that good. It looks great, it plays great, it's got a ton of content, it's a paltry 3 bucks with no in-app purchases. If you like racing games even in the slightest, you'd be doing yourself a favor by playing this little gem of a game. It's doing well in the charts currently and people in our forums are raving about it, so hopefully that means there's a long, bright future ahead for Horizon Chase." "Arcade racers should instil within you a sense of joy. They should make your heart shudder, your buttocks clench, and your mouth spew out the very worst expletives when you crash on the last corner. But they should also have a sense of swagger. A cockiness that's nothing to do with any in-game characters or tacked-on story, but that stems from the stench of nitrous oxide burning and the sound of tyres squealing to stick to the road. And Horizon Chase has all of this in spades. It's full of bravado, but it's all generated by some of the best racing you're ever likely to see on mobile. And it looks absolutely stunning." ""It looks gorgeous, with some stunning weather effects, and an odd but pleasing low-poly roadside-object style; it sounds great with veteran games musician Barry Leitch on soundtrack duties; but most importantly, it handles perfectly, and is a joy until the very last track." Craig Grannell and Giancarlo Saldana." "A love letter to old-school gaming, Horizon Chase channels the Amiga’s Lotus series and Top Gear on the SNES. Thumbing its nose at ‘realism’, this is arcade racing at its best. A few races in and you’ll wonder why all racers aren’t made this way." "Even though I am not always into most racing games, I have to say that Horizon Chase is one of my favorite games of the year so far. The graphics are artistic and magnificent, the music is a quirky blast from the past, and the controls are easy enough for anyone to pick up. The gameplay is challenging, there is a ton of content for the price, and replay value is high. Seriously, there is nothing I don’t like about this game, and I’ve had a hard time putting it down since I bought it last night." 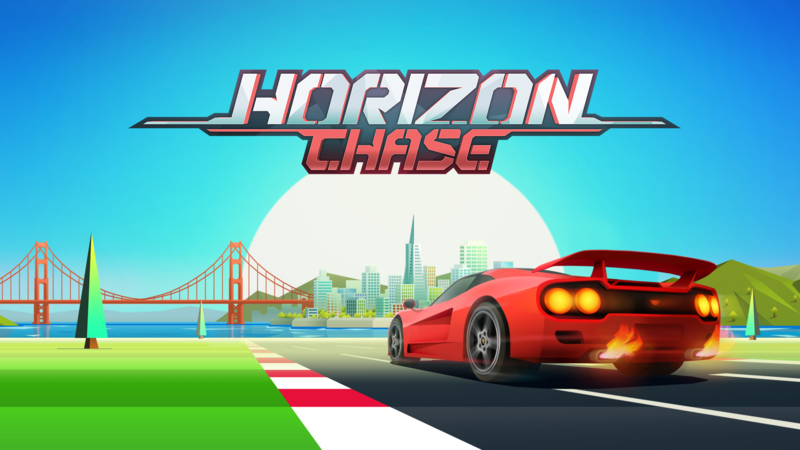 "Great controls, great feelings and tons of nostalgia make Horizon Chase one of the best racing games on iOS devices." "Nice nod to the 80s." "I had so much fun racing I got into "the zone". Horizon Chase ROCKS." "The visuals seem to be striking a balance between paying tribute to retro games and keeping something of a modern feel." "Retro heads will certainly dig it. I know we did: a panel of judges (including journalists, developers, and publishers) picked it as our third favourite game from a pack of nearly 30 at the speed dating-style show off."